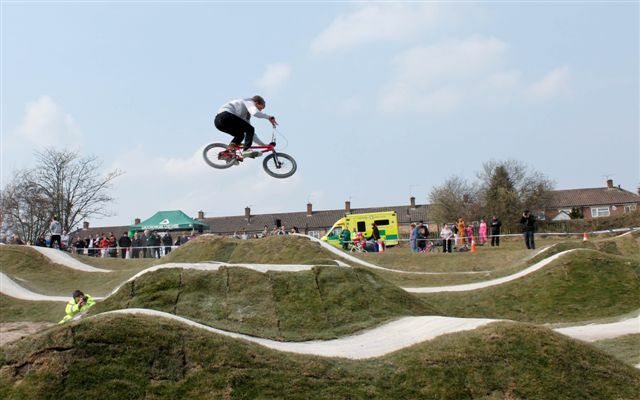 A state-of-the-art BMX track in the Parklands area of Ellesmere Port is now officially open following a special celebratory event. The £170,000 project’s completion, which has also seen major improvement works to the green space’s footpaths, is the result of a number of years of work led by the Council’s Our Place team in partnership with Groundwork Cheshire. Working together with partners including local residents, Cheshire Police and main contractor County Landscapes, the project was based firmly around the needs of the local community and was funded by FCC Environment Ltd through the landfill communities funds administered by WREN, the Ellesmere Port Area Partnership Board, Cheshire West and Chester Council and contributions from local developments. The idea to create a BMX track at the Parklands site off Valley Drive initially came through the Our Place team’s local Neighbourhood Action Group in the area, which was quickly followed up with full resident consultation. New ways of local working allowed residents to take their ambitions to deal with multiple issues through to being delivered through genuine partnering and shared funding. Executive Member for Community and Environment, Councillor Lynn Riley, said: “Yesterday’s special celebratory event was a real chance for us to thank everyone involved in this project for their support – it has taken a few years to come to fruition and without our partners we wouldn’t have been able to complete such an innovative and challenging project that really meets the needs of local people. “Throughout the works residents have popped down and shared their support and pleasure at the renovation works and the bike track has already proven to be hugely popular with local young people. Designed by specialist contractors Clark and Kent, the BMX facility is completely unique, making the best use of the existing landscape and providing an exciting and challenging course for users. The network of new pathways, which were completed by County Landscapes, provide greatly improved access routes through the area for pedestrians and cyclists and form part of the Ellesmere Port Greenway – a ‘green loop’ of over 50km of multi-user pathways and cycle ways in and around Ellesmere Port. Led by the Ellesmere Port Development Board, the Greenway will link local attractions and places of interest by making it easier for everyone to get around on foot or by bicycle, as well as improving access to local green spaces. Andrew Miller MP, who cut the ribbon at the special event, said: “This is great for our young people and I look forward to seeing BMX stars of tomorrow developing their skills on the track! Local member, Councillor Ben Powell, said: “It was great to see so many local residents and partner organisations at this event – which really is testament to the fantastic support and hard work that so many people have contributed to make the track become a reality. “The development of the new track began initially due to the input of Cheshire Police who, along with young people living locally, have been instrumental in getting the project off the ground. WREN Grant Manager, Richard Smith, said: “This is one of the largest projects that WREN has ever supported and funded in Cheshire and I am really pleased to see the final designs come to fruition.